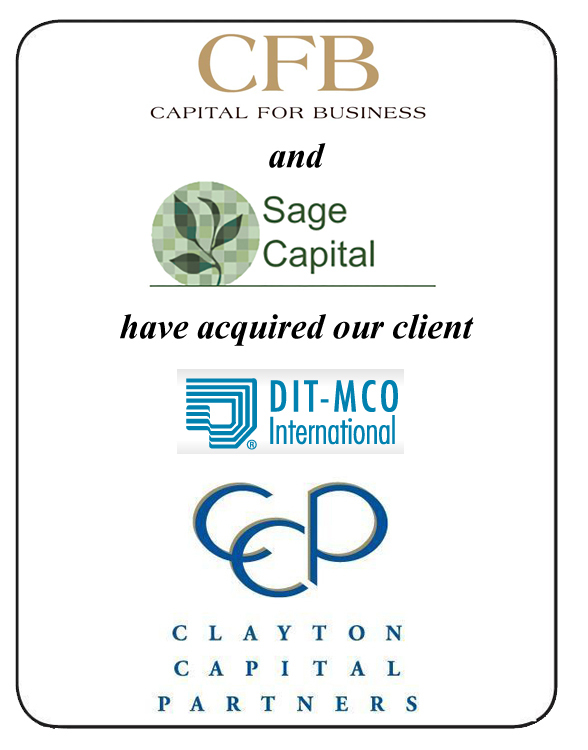 DIT-MCO International to Capital For Business and Sage Capital LLC. Capital For Business (www.capitalforbusiness.com) based in St. Louis, MO, is a national private investment firm focused on providing capital to middle-market businesses with proven management teams and a high potential for growth. Sage Capital LLC (www.sagecapitalllc.com) based in St. Louis, MO, is a private equity firm providing long-term capital and expertise for small and middle market businesses in North America. DIT-MCO International (www.ditmco.com) based in Kansas City, MO, is a manufacturer of wire integrity test solutions world-wide for manufacturers of commercial and military aircraft, defense communications and weapon systems as well as space and satellite applications. If you would like more information about this transaction or Clayton Capital Partners, please contact Kevin M. Short at (314)725-9939 x 525 or via email at kshort@claytoncapitalpartners.com.